Seven issues of East Wind, a publication of UNC Chapel Hill‘s Asian Students Association, are now available online at DigitalNC. Started in 1993, the paper appeared roughly once a semester for the first several years of its run. 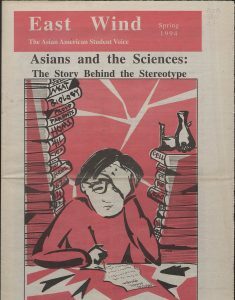 The issues now on DigitalNC (December 1993-Spring 1998) cover a wide range of topics relevant to the Asian-American student community at UNC. With its editorials, advertisements for upcoming events, restaurant reviews, and much more, East Wind provides a forum for both ASA members and others to promote, criticize, and discuss Asian-American culture from numerous angles. Much of the paper’s contents focus on issues of race and identity within the Asian-American community. The newly digitized issues of East Wind are another addition to the already considerable amount of UNC Chapel Hill materials currently hosted at DigitalNC. For more information about East Wind and the Asian Students Association at UNC, visit The Carolina Story and its exhibit on UNC student organizations.